Do you have an ugly Christmas sweater? You will get to see mine and I am not sure if it's totally ugly, but it definitely is tacky! So it was my inspiration when designing the earrings for this blog hop. Our blog hop hostess, Diana Ptaszynski, always has fun ideas for her friends and this was a must do for me! I needed a small break from my busy holiday show season and this was it! So be sure to hop around all the blogs to see what the designers have come up with. Since white deer are on my sweater, I purchased these 2 white acrylic deer pins at a holiday show I was selling at. They were originally pins, so I said a little prayer before removing the pin backs so I didn't break them LOL! I rubbed red alcohol ink on them then distressed the tops so the ink is barely seen in the recessed areas. The eyes needed some bling, so I glued 2 flat back crystals on. I also took a chance with the red pom poms with silver glitter accents. They do not have holes so I again hoped my idea of shoving beading wire through them would work - and it did! See - these tacky earrings were meant to be in my life! I made 2 10mm emerald green ceramic beads and used 2 8mm clear faceted crystals to complete the look. Thanks Diana! And I hope everyone has a fantastic holiday season! And these are the ceramic pieces I made to go along with the beads I received. I ended up not using the owl bracelet topper for the challenge, but he's there, "just in case!" Now for my necklace design. I felt antique bronze was a better metal match to the beige and black, so I used an open link chain, a toggle bar, 20g wire. I added seed bead accents and the chunky, multi tone Czech barrel beads in this fun, springy design. It measures 18" long and has the crystal Swarovski heart accent that Beth included by the clasp. I used Vintaj ear wires in the left pair and a fun pre made antique copper earring findings and charm in the right pair along with ceramic beads and Czech glass. So I have lots of beads left over for future designs. Thank you Beth for spoiling me with a wonderful goodie package! I'd also like to thank our swap hostess, Linda Anderson for putting together another fun event. Be sure to hop around to all the participants blogs to see what wonderful jewelry designs were created! I really enjoy being paired up with another jewelry designer to swap beads and to get to know each other. The anticipation of what is going to arrive in that special little package is exciting! My partner this year is Carol Dillman. She is a lampwork artist as well as jewelry designer. How cool is that? In fact, she created the lampwork beads that i received! I rarely design in the color palette of the beads that I received, so it was a bit of a challenge for me to decide what direction to go in. I am a ceramic bead artist, so I found my maroon glaze matched the beads very nicely that Carol made. I live in Florida and sea life is my favorite inspiration, so I made a focal starfish glazed in the coordinating glaze. I also made a pair of flower earring charms to pair up with some additional beads in the set. I challenged myself a bit further by creating a double layer design. I am quite happy with the way it turned out! The length is 18" which allows the starfish to be the center of attention in this design. Carols lampwork beads add nice contrast to the ceramic, gemstones and Czech glass accent beads. The flower earrings are fun and cheerful. I usually use commercial ear wires, but I made my own for this design. Even though they are a little longer than I usually make at 3", I love them and I hope you do, too! Swap and Hop Is Coming! I have been participating in the fun Swap and Hop event for quite a few years now, and each time it gets better and better! 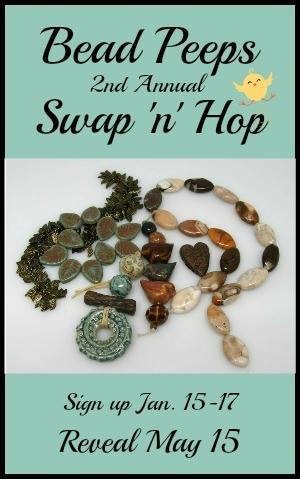 Our swap hostess, Linda Anderson, pairs up the participants, so here's some info about me, what I like, don't like ( bead related Lol) and some jewelry designs I have recently made. I am also a ceramic bead artist, so I try to include at least one of my handmade beads in each piece of jewelry I design. I live in Port Charlotte, Florida which is on the west coast in between Tampa and Fort Myers. I am influenced by all the beaches and sea life surrounding me. So all shades of blue is seen a lot in my jewelry designs. But - I also love nature. Birds and owls are another of my favorite design subjects. I think shades of brown capture much of nature. Green is another color I love. There are so many yummy shades from bright lime to subtle mint. I like using a crystal accent for some bling in my jewelry and I also like the "other" metal shades like bronze, copper and gunmetal rather than silver and gold. I don't use seed beads often except for the larger ones for accent beads. However - a thing on my to do list is to learn how to bezel set my ceramic cabochons with seed beads. Some day, right?! I have been participating the last few years with the Art Charm Swap and Auction. This years theme is fairy tales. Well, I am a bit rusty with this subject, so I Goggled it and a whole list came up. Some I was familiar with, some I never heard of, and some I didn't realize were a fairy tale! The fairy tale I chose falls into the third category - not realizing it was a fairy tale! Alice in Wonderland with the little white bunny with pink eyes that lured Alice down the rabbit hole. 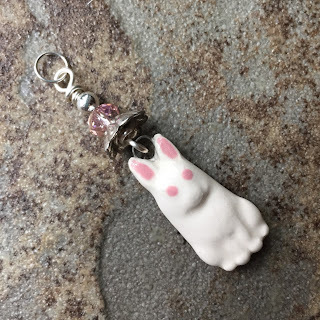 I made the charm out of white ceramic clay and painted the eyes and ears pink. I used a silver plated bead cap to help hide the wire and finished the charm with a faceted pink crystal and silver plated round spacer bead. I think he's a cutie! I would follow him down a rabbit hole, too! I will be back to let you know more about the auction - how it will work, the site you can find it on, and with the direct link to take you there. Thank you to our Hostess, Jennifer Cameron of Glass Addictions. She has the huge job of coordinating all the behind the scenes stuff as well as running the auctions. She rocks! Please hop around to all the other blogs to see more charms and the read about inspiration behind each one. 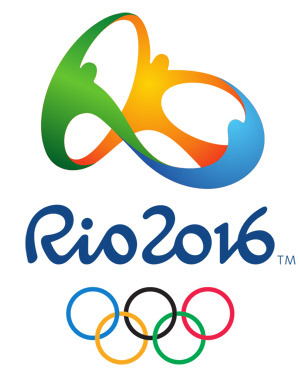 When I think of the Olympics this past summer, I think of the rings used in the logo. Those rings have been used for as long as I can remember. This year's tropical setting in Rio, also makes me think of tropical beaches in shades of teal, turquoise and beige. Then I took closed hammered rings and wire wrapped orphan ceramic and lamp work beads in between them to form a 30" over the head necklace. I love that I was able to use these beads and make a one of a kind design, too! First off, a big thank you to our hostess, Linda Anderson. It's such a big job to match all of us up and coordinate all the behind the scenes action. I always enjoy participating in swaps. Sometimes we are paired up with one person, like we are with the swap and hop, and other times we send in a certain amount of beads, charms, pendants, jewelry, and we receive goodies from random participants. My swap partner is Jenny Kyrlach from Cincinnati, Ohio. The best part of the swap for me, is now I consider Jenny a friend! Jenny actually sent me beads, pendants and finding to create 2 sets of designs. She totally spoiled me! First I am going to show you how much she sent me that I haven't even used yet. I will add them to my bead stash and use them in the future....paper beads, crystals, Czech and lampwork glass and fun polymer clay beads. For this necklace, I used a ceramic square pendant, paper beads, waxed linen, chain, jump rings and a leaf toggle. Waxed linen is my favorite stringing material. It adds color to my design, the knots add to the spacing of the necklace and it is comfortable to wear. This measures 18" plus the 6" pendant makes this necklace a wonderful piece to dress up a plain shirt. I made a pair of earrings with some wood beads, bead caps, decorative spacer beads and Vintaj ear wires. I used 20g Vintaj wire to assemble them. Now for the bonus piece. Jenny made so many varieties of her paper beads for me. In both necklaces, I wanted her beads to take center stage. I love the color combo of white and black with a pop of red. It's very classic looking to me. Once again I used waxed linen for my stringing material, but I used red so it really becomes a part of the design instead of just a stringing material. I hope you enjoyed reading about the swap and my creations. After you visit Jenny's blog, please hop around to these other wonderful swap and hop designers blogs to see what they created! Whimsical Ceramic Beads and Jewelry created by Michelle McCarthy.